In Finland, even financers understand that film productions require lots of resources. This recognition provides indispensable support. AVEK grants are extremely helpful in setting projects in motion. The Finnish Parliament has decided to keep the compensation for private copying at the current level in the budget for 2019. A significant number of members of parliament from all parties were behind the cross-party advocacy work. The common goal is to prepare a reform of the current budget-based system during the government’s term in office that begins after the election. Ulla Simonen has been appointed as the new director of the Promotion Centre for Audiovisual Culture AVEK. Simonen starts in the position on 1 March 2019 when AVEK’s current General Secretary Juha Samola retires. The winner of the 2018 AVEK Award is visual artist Saara Ekström. The AVEK Award for media arts, worth EUR 15,000, was presented today at the 40th anniversary celebration of Kopiosto, held in Bio Rex, Helsinki. The AVEK Award, granted by the Promotion Centre for Audiovisual Culture (AVEK) operating within Kopiosto, is the most significant accolade in the field of media arts in Finland. Support decisions for documentary and short films as well as media art are published monthly on our Finnish website. Support issued for training, international promotion, and audiovisual culture are published as quickly as possible after support decision meetings. How do I send my application to AVEK? Can I apply for support for several works at the same time? Online application system does not work, what to do? How long is the decision-making process? Where should the final report be delivered? You will find the answer for these questions and many others in our FAQ section. The AVEK magazine is published in Finnish twice a year, in spring and autumn. 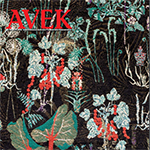 The themes of the latest AVEK magazine are film music, sounds and impact. Kopiosto enables the use of copyrighted publications and audiovisual works easily and responsibly. It also makes sure that creative professionals receive the remuneration owed to them for the use of their works. Kopiosto is the most comprehensive copyright organisation representing the creative industry in Finland.